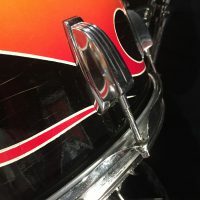 This is the only drum set that Montrose drummer Denny Carmassi played from the day the band was signed to Warner Bros. Records until the band folded in 1977. 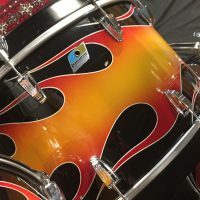 He bought the set in 1973 at the legendary Frank’s Drum Shop in Chicago in 1973 with money he received from the record company advance. 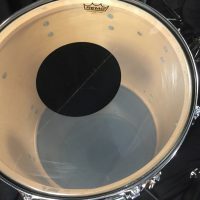 The set began it’s life with a Black Cortex finish. 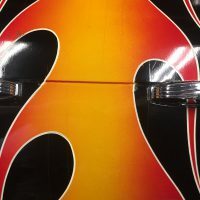 In 1974 he had the set custom-finished in with this scorching, hot rod inspired flame paint job. 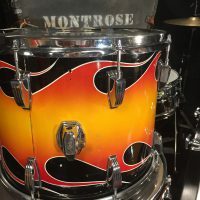 The set can be seen on the back cover of Montrose’s 1975 album “Warner Bros. Presents, Montrose.” Shortly after Montrose broke up in 1977, Carmassi re-emerged in singer Sammy Hagar’s solo band, still playing his flaming Ludwigs. 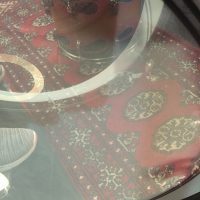 MORE INFO AND VIDEO BELOW PHOTOS. Single click image to enlarge. These are some BIG drums. 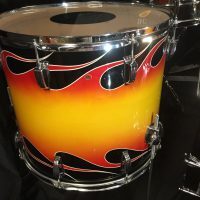 26″ x 14″ bass, 18″ x 16″ floor tom and a 15″ x 12″ rack tom with 3 ply maple and poplar shells and maple reinforcing rings. 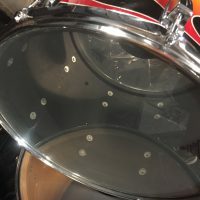 The interior of the floor tom is finished in clear lacquer. 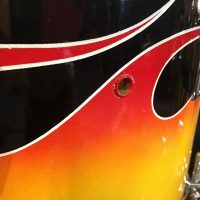 The interiors of the bass drum and rack tom were repainted black. The drums are in excellent shape. 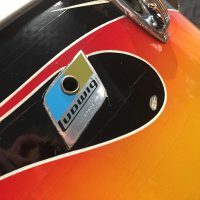 Upon close inspection you can see some checking in the lacquer finish. 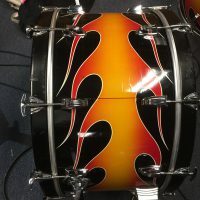 The interior of the rack tom and bass drum have been painted black. 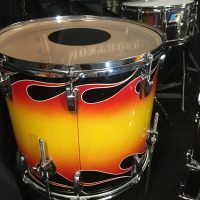 Carmassi sold the set to around 1984 while based in Seattle during his tenure as a member of Heart. 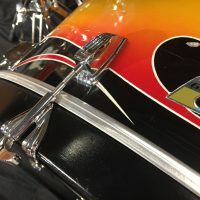 The original Ludwig bass drum spurs have been replaced with slightly larger 1/2″ Ludwig spurs using the original screw holes. No new holes were drilled. 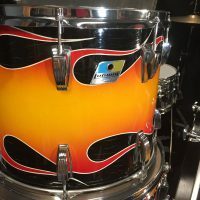 A pair of Ludwig modular mounts were added on the batter side of the bass drum after the set was sold. 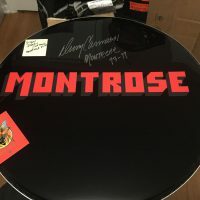 The signed “Montrose” logo bass drum head is included. 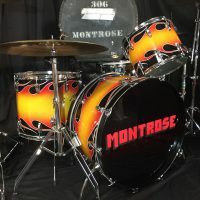 The head is a replica of the logo head seen on the back cover of the band’s “Warner Bros. Presents, Montrose” album. 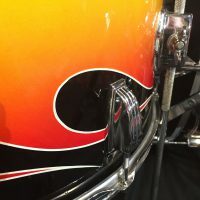 Carmassi signed the head after the photos of the drum set were taken. 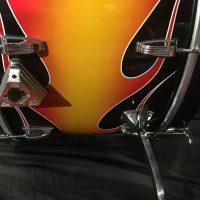 A “Jump On It” tour pass and a full set of cases including the stenciled bass drum case in the photos are included. COA signed by Denny Carmassi.